St. Pope John Paul II worked for social justice but he worked against liberation theology and communism. The modern usage of “social justice” seems to advocate redistribution of wealth and equality through totalitarian mandates. So it takes force to make all equally low in economy. Rather, we need to facilitate economic mobility with freedom of opportunity. The diversity of human capacity will achieve redistribution toward an elevated economy for more. Isn’t Venezuela a screaming example against socialism? Isn’t the United States home of thousands of citizens who fled communism? 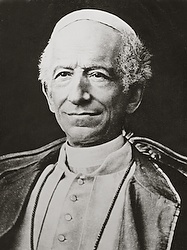 I think Pope John Paul II is the patron saint of our age and Pope Leo XIII a well-remembered counselor. With Social Security, Medicare/Medicaid, gov't agricultural and business subsidies, along with federal, state and municipal fire, utility and emergency agencies, it seems that the USA is not only a screaming example of socialism but a sanctimonious voice of self-satisfaction as well. This comment has been hidden due to low approval.